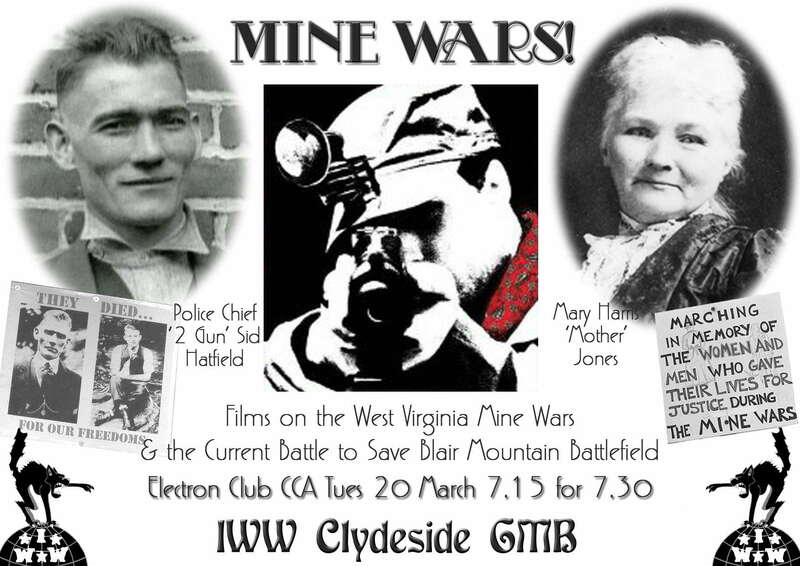 The next Clydeside IWW film night will be on 20 March, Electron Club, CCA (7.30 prompt start, as the whole programme will last about 90 minutes). Following FW Brendan Maslaukas’s article ‘The Battle for Blair Mountain’ in October 2011’s issue of the Industrial Worker, we will be showing the West Virginia Mine Wars documentary Even the Heavens Weep (1986) and excerpts from West Virginia (1995). The Mine Wars – for the right to organise, and against the servitude of the ‘company town’ system – were real, bloody warfare over more than a decade, culminating in the largest civil insurrection in the US since the 1860s: an extraordinary story. The fact these films were recorded some years ago means that they include accounts from elderly eye-witnesses, now dead, as well as archive footage from the early 20C. There are also a couple of short recent features on the ongoing campaign and 2011 march to save Blair Mountain – which had its 2009 historic site status revoked because of mining company pressure – from ‘mountain top removal’. The campaign has brought together miners, labour activists, historians, archaeologists and environmentalists. See The Friends of Blair Mountain. This entry was posted in Events, Glasgow, history, Meetings. Bookmark the permalink.